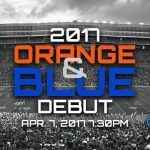 It’s the play that turned Ben Hill Griffin Stadium into an “insane asylum” on Saturday night, according to team play-by-play man Mick Hubert. 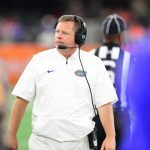 It’s also the play the Florida Gators used to beat the Tennessee Volunteers — not only on Saturday, Sept. 16, 2017, but on Saturday, Sept. 26, 2015 as well. The same two coaches, the same field, the same yard line and distance away from the end zone. Most importantly for Florida, the same result: a 63-yard touchdown pass from a young quarterback to a young receiver to earn an unlikely come-from-behind victory over SEC East rival Tennessee. Don’t believe me? I wouldn’t either … because it frankly sounds improbable. Now-redshirt junior quarterback Luke Del Rio, who was sitting out a transfer season in 2015, was also in the same position Saturday he was two years ago: on the sideline. But he knew what he heard from head coach Jim McElwain and what he saw transpire. “Same exact play call,” Del Rio wrote on Twitter. Don’t believe him? I wouldn’t either … because it frankly sounds impossible. Yes, the ball went to a different part of the field, the read was different. The play was the same. Check the bottom of the second video — that’s where the play was made two years ago. Don’t believe your eyes? Now you’re just kidding yourself. 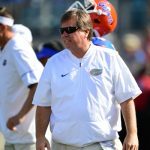 “It was ‘Train Right Open, Big Ben In,’ the same exact play,” McElwain told the media after the game. “Just give me a chance,” sophomore wide receiver Tyrie Cleveland reportedly told redshirt freshman quarterback Feleipe Franks, who dropped a dime more than 65 yards in the air for the walk-off win on Saturday. Junior WR Antonio Callaway and former QB Will Grier, the 2015 connection, did not have the chance for such an exchange this year; the former has been suspended for weeks, while the latter is currently leading West Virginia. Nine suspended players? A short week of preparation due to Hurricane Irma? A gassed defense on its heels the entire second half? These Gators fought anyway, and they did it in an oh too familiar way. The QB and receiver deserve recognition, BUT – the game was won by the selfless person that threw that block that allowed the receiver to get to the endzone. That person should have received the game ball to encourage true selfless team play. C’mon guys. It was NOT a Hail Mary. THAT was a pass…. with a game winning block that allowed the catch. Desperation heave to end zone from 60+ yards out = Hail Mary.